A balanced cat diet is vital to the well-being of cats. Therefore, it is important to learn about cat nutrition and how to provide a balanced diet to your cat. Indeed, feeding your cat with nutritious and healthy food can help prevent illnesses and improve your cat's quality of life. But, where to begin? What kind of cat food should we feed our kitties? How much? How often? This section provides you with general information about the importance of a balanced pet diet, plus a few tips and suggestions. Note: Always consult your veterinarian to determine the best diet for your cat. 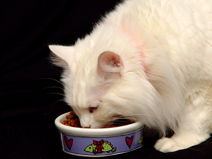 Feline diet - What do cats eat? In the wild, a cat diet basically consists of meat. Cats are carnivores. Their teeth are designed for biting and devouring their prey. Cats’ digestive tract is especially adapted to the digestion of meat. Indeed, felines are skilled and agile hunters. Cats' papillae (small protuberances in the cat’s tongue) help them retain the meat they take from their prey. Unlike other carnivores, cats ingest practically no vegetables. Having said that, cats do eat grass such as catnip. Because cats are obligate carnivores, an exclusively vegetarian diet is not recommended. Now, our domestic cats don’t need to go hunting for their food, even though most still enjoy hunting mice and other small critters. Cat owners are responsible for providing their cats with nutritious food. And we've already established that a healthy feline diet is an integral part of your cat's health. Thus, it is important to learn all about your cat's nutrition needs. And that is the aim of this article. It bears repeating: a balanced cat diet will help your kitty stay in top shape. Below you will find information about the different types of cat food. Take into account the age and health of your cat when choosing cat food. And don't forget to consult your veterinarian to help you design a diet that meets your cat’s needs. There are different types of cat food: dry, semi-wet and wet (or canned). So, which is best? Each type has its benefits. While dry food is less messy and more convenient, wet food contains water, which is a good thing - especially if your kitty doesn't drink enough water. Another idea is to alternate both types of food. This arrangement will provide your cat with variety. Personally, I like to give my cats both. Cats also need to ingest fat, albeit in moderate amounts. Most commercial pet food includes carbohydrates. Commercial cat food also includes ingredients derived from vegetables such as corn. Usually, these ingredients are used as fillers and are not an essential part of a balanced cat diet. However, fiber from carbohydrates and vegetables do aid in the prevention of constipation. High-quality, or premium, cat food is usually more expensive but it has been developed to provide your cat with a balanced diet. If you can afford it, then spend a little more and buy premium cat food, which contains more nutrients and less "fillers". When choosing cat food, read the label to determine whether it complies with the AAFCO requirements. Check to see if the main ingredient is protein (chicken, fish, or beef, for example). Avoid foods with too many by-products, corn meal, and preservatives. And always check the expiration date. Cats can be very fussy when it comes to their food. They can get easily tired of their regular food. This is understandable because even humans get tired of eating the same old food. Provide variety by offering different flavors and types of food. For example, if your cat gets tired of dry food, offer canned food. A combination of dry and wet food is also a good alternative. These changes should be introduced gradually. This measure will help prevent your cat from getting sick. Ask your veterinarian how many times (and how much) you should feed your cat. My veterinarian suggested two options for my cats: one or two big meals during the day or several small meals throughout the day. Again, the best schedule for your cat will depend on several factors such as the age and health of your cat. If your cat has health problems, he or she might need a special diet. Water is also an important part of your cat’s diet; therefore, provide your cat with fresh water everyday. A word of caution: be extra careful when changing brands of cat food. Introduce your cat to the new food slowly and gradually to avoid digestive problems. Avoid giving your cat human foods such as meat, bread, candy, table scraps, or bones. In addition, don’t give your cat cow’s milk as in can be difficult for cats to digest it. By the way, visit our cat food bowls page for tips on how to buy the right bowl. And go to our water bowls page for information on these items. Generally, male cats weigh from 9 to 14 pounds, whereas female cats weigh from 6 to 10 pounds. Lately, obesity in cats has become quite common. Obesity is a very serious health problem for cats. Indoor cats are particularly prone to becoming overweight because of overfeeding and lack of exercise. Consult your veterinarian to help you determine your cat’s ideal weight. If your cat is obese, your veterinarian will help you adjust your cats diet. A balanced cat diet and exercise will help your cat maintain a healthy weight.